The Cars You Can Only Dream of Owning! Remembering my promise to write a post on the Petersen Automotive Museum in L.A., I don’t want to keep you in suspense any longer. Today I discuss the supercar exhibit at the Petersen showing through October. When it is wet and rainy out in L.A. (which it almost never is), fancy car sightings are about as rare as seeing an elephant in front of your house! That left my Grandpa and me few choices to car spot. We decided to go to the Petersen Automotive Museum to gawk at the supercar and hybrid/alternative fuel exhibits. The hybrid exhibit was cool enough, but the supercar exhibit was even cooler. The hybrids and alternative fuels cars included a: Toyota Prius, Ford Focus Electric, Mercedes-Benz SLS AMG E-Cell and a classic Chevy truck converted to coal power. Those cars could be cars of the future! (Minus the Prius! Which is car of the present.) What about that old Chevy? Coal power is terrible for air quality and is fossil fuel dependent. The Porsche 959 was the fastest car of its day, with one even hitting 202 mph! Much of the technology that was inside the 959 was so good that it has been used on all the Porsche 911 Turbo’s! The Bizzarini Manta was a one-off (one-off means that the vehicle is just a crazy idea made into reality by some random person) car that was converted from a Le Mans prototype into a street car. About 30 were made total, only about 8 remain today. The Bugatti Veyron Grand Sport is the second fastest production car in the world. The fastest is its big brother, the Veyron Super Sport. The Grand Sport can hit 253mph and go from 0-60 mph in just 2.8 seconds. The Veyron Super Sport can hit 268 mph and go from 0-60 mph in just 2.6 seconds. 1. It must have all or many of the latest technological goods equipped on it. 2. It must be very easy to drive at high speeds. 3. It must have very good performance to actually be a supercar. 4. It must have a very high top speed. I have already done a biography on Robert E. Petersen. Here is the link to my Petersen post. Feel free to read it. My field trip to the Ferrari/Maserati dealer in L.A. I am entering early as I am on a field trip. Guess where? I am in the City of Cars. You know it – it’s Los Angeles! Car stories and viewings have been slow as many people here don’t like to drive their Ferrari’s in the rain. And it has been really rainy down here. My Grandpa and I were driving along, having just come from the Petersen Automotive Museum for an exhibit on supercars. I told my grandpa Jack to turn into a driveway so we could see the cars in the Ferrari dealership. On a whim, we went in. So, we got to sit in a brand-new Ferrari 458 Italia, the car that I am saving up my money to get! Meanwhile, my grandpa Jack was sitting in a Maserati GranTurismo S coupe. That was the car that I tried to convince him into getting, I guess that it didn’t work! There were only about 10 cars in the showroom total, most were Ferrari’s! There was an actual potential buyer looking at a Ferrari 599 GTO with the Handling GTE package. WOW! It had the optional Matte black paint finish. I can’t afford to get it by myself, but I will split the cost with somebody! I promise to do some future stories from this trip down in LA. One of them will be on the Petersen Automotive Museum’s supercar exhibit. March 22, 2011 April 11, 2011 zoomvroom Tech Talk, The auto dictionary. Look it up here! People often wonder what parts of a car are and what is its purpose. My job is demystify car words for you. Today I am covering carburetors. The carburetor is basically a big blender that mixes fuel and air together before it is pushed into the cylinders. A carburetor barrel is like a tube or pipe that holds the air inside before the fuel is mixed with it. The air is in the “barrel”, while the gasoline is in a small container nearby. A certain amount of fuel is pushed into the “barrel” and the mixture is mixed and pushed out and into the cylinder. The carburetor comes in different sizes: one barrel, two barrel, four barrel and even 10 barrel! The early diesel engines could not have a carburetor, the mixture would “flood” the engine. The early planes had huge 16 barrel carburetors! Some of the best-known carburetor makers are: Holley, Solex-Mikuni, Weber and Edelbrock. Many cars with fuel injection can easily be switched to carbureted power. Honda, a legacy of great cars. Why did I pick Honda? Because Japan is on everybody’s mind right now and I would like to honor Honda. I saw a video of wrecked Honda’s and Toyota’s in a shipping yard. The yard had been hit by the tsunami and earthquake. It was very sad to see thousands of wrecked cars. They were destined for the U.S.
Honda started out in 1959 as a small automaker making even smaller trucks, called the Honda T360. It was designed to be small as to avoid the “chicken tax”. The chicken tax is a government tax on all new cars. The T360 was so small that it couldn’t hold an average dining-room chair! It barely sold in Japan and therefore, never made it to the U.S. Good thing. It would have been too small for Americans. It would be too short for my sister! Honda has numerous factories in Japan and the U.S. The factories make all of Honda’s motorcycles and cars. Honda has also been a large manufacturer of hybrids since 2000. In 2001, Honda surpassed Nissan as the largest Japanese automaker in the world. In 2008, Honda passed Chrysler to become the fourth largest automaker in the U.S. Today, Honda is the sixth largest automaker in the world. Honda’s line-up of cars sold world-wide include: Fit, Civic, Accord, CR-V, Pilot and Odyssey. The Honda Civic was introduced worldwide in 1978 as a small, affordable compact car available to the masses. My uncle owned one of the original Civics! The Civic is no longer sold in Japan- it isn’t popular enough! Americans just keep buying the Civics off the lots. When the next-generation Civic comes out this fall, it will be the 8th generation. It will look very similar to the current Civic, but it will have all-new engines and transmissions. The Honda Accord came out in 1976 and was produced in Sayama, Japan until 2008. The current Accord plant is in Marysville, Ohio. The Accord has been offered in a large variety of body-styles including hatchbacks, sedans, wagons and coupes. My mom and dad both owned one during college! My grandpa Jack has a 2009 Honda Accord EX-L V6 coupe. The Accord’s newest style is the “Crosstour”. It is almost like a wagon/SUV. The Honda Insight is a medium-sized hatchback about the size of a current-generation Toyota Prius. It has Honda’s true and tried Integrated Motor Assist. IMA is a simple hybrid system that has an electric motor that is only good for helping out at idle and in parking lots. The Insight is the cheapest hybrid currently on sale in the U.S. The original Insight was nominated for the 2001 North American Car of the Year by J.D. Power and associates. The Honda CR-V came out in 1995 as a small, affordable SUV meant to be every person’s car. Its sales have amounted up to 1,785,540. You can buy a really big house with that much money. The thing is, it isn’t money, it’s the number of cars sold. Too bad it’s not money! I had my eye on that Bugatti Veyron Super Sport with the clear-coat finish! Darn! The Veyron SS costs as much as all those CR-V sales! The Honda Fit has been one of Honda’s best-selling hatchbacks. Its sales amount up to 1,363,358 total Fit’s sold! WOW!!!! It has been the recipient of three Car & Driver 10Best awards and is one of the safest compact cars out on the road today. It is called the Honda Aria and Honda Jazz in other markets. Trivia note: the Fit’s windshield is the same size as an average minivan’s! The Honda Odyssey is Honda’s only minivan, but it is one of their best-sellers. My mom and dad almost got one instead of our Chrysler Town & Country. They didn’t want to wait to get the Odyssey because there was a long waiting list. The Odyssey came out in Japan and was so popular that Honda decided to take the Odyssey to other markets, first the USA and on and on. The Odyssey is part of the New York City Taxi & Limousine Commission. It was also badge-engineered by Isuzu as the Isuzu Oasis. The current generation has Honda’s first six-speed automatic. Well, actually it is the second, the first is in the Acura MDX. My favorite Honda? The 2008 Honda S2000 Club Racer (CR). Yours? I am sure that you have one. I am attaching Honda’s website. http://automobiles.honda.com/ Honda has stopped production on all of its cars that are made in Japan because of the crisis there. You can expect to see very few new Civics and Elements out on the road for the near future. Pity. Honda was also the first Japanese auto-maker to release a dedicated luxury car brand, Acura. Honda’s slogan is “Honda. The power of dreams.” That is very true, as many cars that they have made are well-loved cars that can last a very long time. Jerry in his Winklemann Formula Ford at Bridgehampton. As John Lennon said, “You may say I’m a dreamer but I’m not the only one.” I dream of racing cars. Mom says “no”. Today I am interviewing Jerry Gladstone (whose mom did not say “no”). Among other careers, he is a retired race-car driver. Interviews are a fun way to learn about lives that are different from one’s own. They educate the reader and show an aspect of life that you might not have known. Jerry, thank you for kindly agreeing to be interviewed. I enjoyed hearing about your auto life. Your Winklemann Ford was very cool! SCCA stands for Sports Car Club of America. Their goal is to bring car racing to all Americans. Sounds fun! Usually people collect cars as a hobby, they usually don’t race. Jerry does both. Jerry had fun racing in SCCA. Today he is a physicist/electrical engineer with a Bachelor’s degree and two graduate degrees. He is married and the father of two adult children. How did you get interested in racing and cars? Jerry G: When I was growing up boys and young men were very interested in cars — it was a car culture generation. (There were no computers or video games to distract us.) My first attendance at a race put the “bug” in my head that I would like to race too, as soon as I could figure out how to get into racing. What did you compete in; NASCAR, Indy, SCCA, or NHRA? Jerry G: I competed in SCCA as an amateur racer. My racing was a “hobby”, I never intended to be a professional. Jerry G: My first race car was a Winklemann Formula Ford. 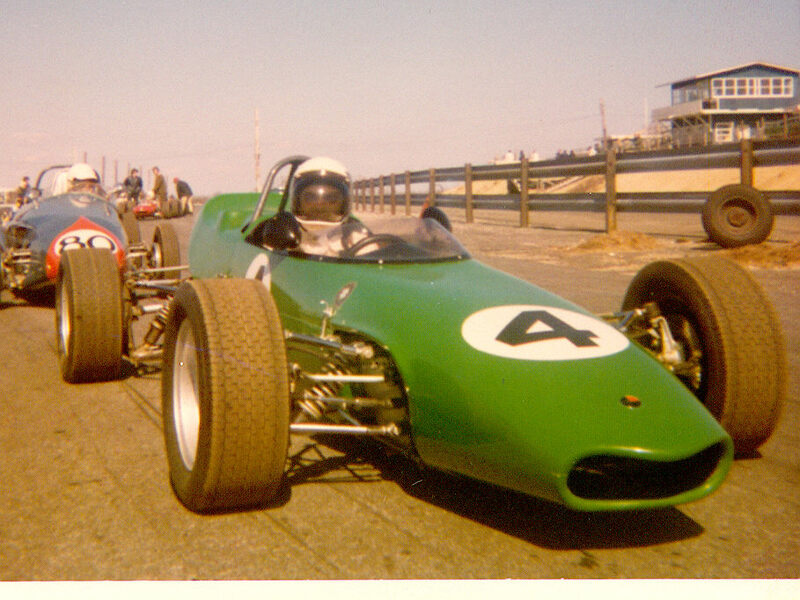 Later I drove a series of Formula B cars including a LeGrand, a Techno and a Brabham. I also had occasion to drive some sports cars including a Lotus, Alfa Romeo and Camaro. What do you think was your most exciting moment in your racing career? Jerry G: Believe it or not, my first day in driver’s school provided me with the most “shocking” moment. I could not believe how fast we were going on our slow orientation laps — it was so much faster than what I thought was fast in a street car. Why did you stop racing and when? Jerry G: I stopped racing when in 1971 as I could no longer afford to race and I was not good enough to be sponsored. It was also time for me to pursue a career. Jerry G: After I bought my MG I joined a sports car club. Many of the members were racers and as I made friends I was invited to come along for racing weekends. I was hooked. Joined the SCCA and went to driver’s school. Jerry G: Bridgehampton, Lime Rock Park, Thompson, Bryar, Watkins Glen, Virginia International Raceway, Marlboro, Pocono and maybe a few others. If these names do not seem familiar to you it is because they are all on the east coast and many of them are no longer in existence. What was your funniest experience when you were racing? Jerry G: People used to laugh at me as I always took a nap between sessions. I took a lot of ribbing about being so relaxed. Do you have any advice on how to become a race-car driver? Jerry G: Go to one of the professional race driver’s schools. They were not in existence when I started; they are superior to SCCA schools and the best way to give it a try. Also, truly understand the commitment of time and money to even be an amateur. What skills do you need to be a race-car driver? Jerry G: Great eyesight and reflexes, competitiveness. An extraordinary “feel” for cars and machines. Some technical knowledge in either setting up a car or being able to communicate with your “mechanic/engineer”. What did you do after racing? Jerry G: Racing was only a hobby, I went on to pursue my career in technology — I am an applied physicist/electrical engineer with a Bachelors and two graduate degrees. Jerry G: My first street car was a black 1962 MGA Mark II. You said that you currently drive a Porsche 911. What generation is it? Jerry G: My Porsche — my fifth — is commonly referred to as a 911, also a Carrera. Technically it is a Type 993 — the last incarnation of the air-cooled cars. Jerry is an officer in the local Porsche club. Many of the tracks that he raced at are no longer in use or in existence. Some of the tracks that Jerry raced at are the hardest and best-known in the country: Virginia International Raceway, Watkins Glen and Lime Rock Park. I have plans to write a post on Virginia International Raceway and Richmond Speedway. Thanks again Jerry for being my first interviewee!! Every boy’s (and a few girls’) dream come true! With a little help from Queen: “Is this real life or is this just fantasy? Caught in a landslide to escape from reality. 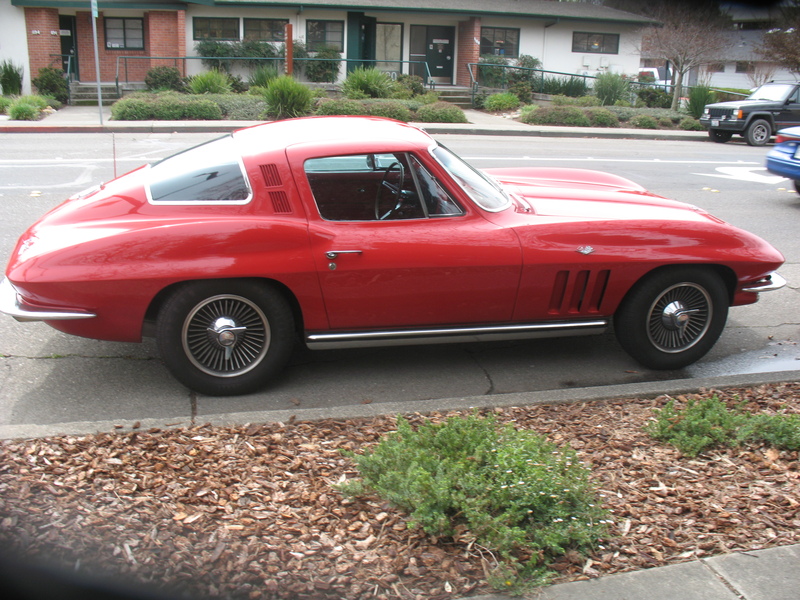 Open your eyes, look up to the skies and see” this beautiful 1964 Corvette Stingray Coupe! Too bad it wasn’t a convertible, otherwise I would have just jumped into it! Cherried out and Roman Red (restored and painted original red) it sported the 454 cc V8 Tri-Pack. That is one FAST Vette! It had the optional 4-speed manual. Some people count sheep at night, I count Vettes, especially oldies! Current events: I bet that you didn’t know that Guy Fieri’s Canary Yellow Lamborghini Gallardo was being serviced at the Lamborghini dealer in San Francisco. Somebody just climbed down the inside of the building using climbing gear and cut the lock, opened the garage door and drove off into the night! WOW!! He’ll probably just wait until the new Aventador comes out this summer. March 8, 2011 March 15, 2011 zoomvroom The auto dictionary. Look it up here! Power Steering works to make steering less work for the driver. This means the driver should be able to turn the wheels of the vehicle when it is stopped, while the engine is still running. For many vehicles, power steering is standard. Truck drivers benefit from this as well. The first power steering system was the 1955 Chrysler 300C with the optional “Hydraglide” steering system. Power steering is steering with a hydraulic assist. Power steering created a whole generation of people without much upper shoulder strength!